The Orioles hosted the Blue Jays for a regular, regular-season game on Tuesday night. Camden Yards looked as beautiful as always, fans were munching on crab dip and waffle fries and baseball players were playing baseball. But there was one cool, new added element to the uniforms of the home team. 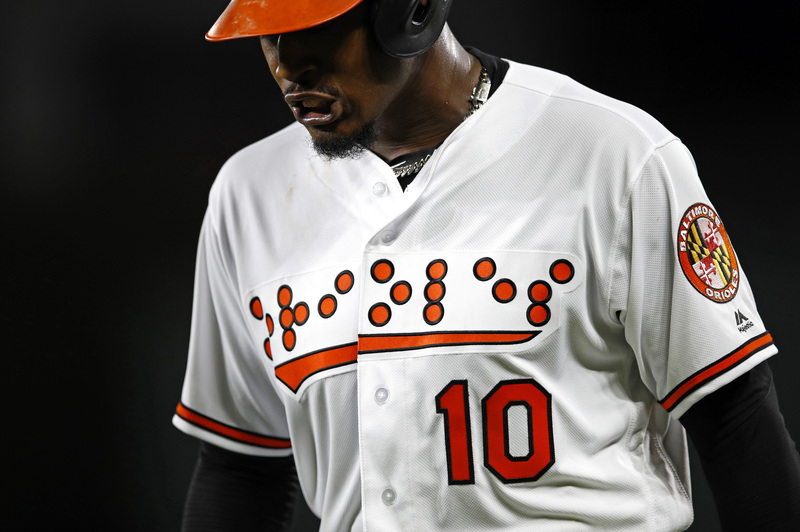 The Orioles had their team and player names spelled out in Braille -- becoming the first team in professional sports history to do so. Fans were also given Braille alphabet cards so they could spell out their favorite players. As you probably read in the tweet above, the O's were celebrating the 40th anniversary of the National Federation for the Blind moving its headquarters to Baltimore. MLB.com correspondent Rich Dubroff spoke to blind season-ticket holder Bill Sciannella, who was much appreciative of the gesture and, of course, likes dingers just as much as the next person. "My favorite part is when they hit a home run and everybody goes crazy," Sciannella said. Yes, that is very fun.